Monthly payment of £15 per month. You can cancel at any time. One-off annual payment of £120. You can cancel after 1 year. Choose which option you prefer from the drop down above and then click the yellow Subscribe button to pay via Paypal. If you don’t have a Paypal account and prefer to pay with a credit or debit card, I can invoice you for the annual amount (£120) and you can pay that way, just contact me to do this. Scroll down for FAQs. 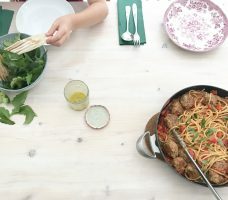 A booklet with exclusive recipes for 15 meals to try each month The recipes are tried and tested and have ways of being switched around to suit chaotic mealtimes and a range of dietary needs. Each month the recipes will make the most of what is in season and will start to stock your freezer and fridge with building blocks. These recipes won’t appear on my website or elsewhere. The welcome pack and materials for your first month will be sent to you on on the day you sign up. I send these during office hours so if you sign up late in the evening, you’ll receive it the next morning. Then each month after that, you’ll receive an email on the first of the month with all that month’s materials in. The first payment will be taken when you sign up. If you’re paying monthly, your monthly payment of £15 will come out on the date that you sign up – so if you sign up on 9th January, you’ll pay £15 each month on the 9th. You can cancel your monthly payment at any time. If you’d like to switch to an annual subscription after your first month, you can just pay the difference of £160 for the the year. Any other questions, please contact me.